Whenever you encounter a barrier, you may install Paperclip from your heap (paying its install cost). Xcredit: +X strength. Break up to X barrier subroutines, if able. Can the Runner spend credits on Cloak to install Paperclip from the heap? No. While triggering Paperclip’s ability from the heap is considered using Paperclip, paying the install cost is part of the install action and not a cost of using the ability. Can the Runner use Paperclip’s paid ability even if its strength doesn’t match a piece of ice? Yes, you can always trigger the ability to get the strength boost. However, if the strength of Paperclip does not match the ice’s strength after this part of the ability resolves, the “break subroutines” part will not do anything. Can the Runner trash Paperclip for Null: Whistleblower ability and then install Paperclip at the same encounter step? No. In order for Paperclip's ability to meet its trigger condition, it must be in the heap at the time the encounter occurs. It looks like you're trying to access sensitive corporation data without a Fracter. Would you like help? I think it's fair to say that Netrunner has grown and changed a lot since the core set days. As the card pool has expanded, new strategies have emerged, new synergies have shown up, and the sheer variety of the game has gotten bigger. Except for Corroder. Corroder has been essentially the only fracter worth mentioning for the entire lifespan of the game. The only people who didn't use Corroder were runners that just could not spare the influence, and so they settled for less efficient options like GS Sherman M3 or Snowball, but it seemed as though nothing would ever truly be better than the core-set fracter. Which is why I am pleased to announce a fracter which equals (and maybe even surpasses) Corroder. That card is Paperclip. The first thing to note is that Paperclip never has a higher break cost than Corroder. I'll leave the derivation as an exercise for the reader, but suffice to say that Paperclip has the same cost as Corroder for any barrier of strength 2 or less, or for any barrier with only a single subroutine, and in any other case you are saving 1 or more credits by doubling up your strength. Eli 1.0, for example, will only cost Paperclip 3 credits compared to Corroder's 4. I could just stop the review there, honestly. A discount on breaking Eli 1.0s, Hives, Heimdalls, and Curtain Walls is more than enough to justify the slightly higher install cost and influence cost of Paperclip for some decks. Which is why the other defining feature of Paperclip is so brilliant. It brings itself back from the dead, at the very instant it is needed. Let's start with the most basic advantage of this. Instead spending to spend a click to install it, you can simply overdraw and discard it, and it will wait patiently for you to need it. This saves you a click--and most runners value a click at about 2s, so you're already breaking even with Corroder. But a card in hand is valuable for other reasons. Faust and Null use them as fuel, you can use it to soak up stray net damage, and although I don't think this is ideal Apex can play it facedown and burn it for later recurrence. You also don't have to worry about Injecting through it--in fact, getting paid to trash it is the best of both worlds. If you're the last madman still playing Exile, this card is already filling your head with insane janky combos. Don't let me stop your insane ravings. The last benefit is a bit more theoretical, so bear with me. In the early game, the runner doesn't want to install any breaker they don't strictly need, because this is time and money that could have been spent running. However, before the ice is rezzed, you don't know what you need. This is why Self-modifying Code is so useful, as it lets you find exactly what you need, exactly when you need it. Obviously, Paperclip lacks that versatility. But it does give you that timing benefit, of being able to hold off on that investment until the last possible moment. Imagine a game where the corp couldn't find a barrier and only installed only code gates and sentries--with Corroder, you might have to install the breaker regardless, just in case that unrezzed ice on the scoring remote is a Wraparound, or else risk a wasted run. With Paperclip, you don't pay for it until and unless you need it. Corroder still has a place, I think. Two influence versus three is not a small consideration, particularly if you're running multiple copies out of faction, and that will turn some runners off Paperclip. Others, who rely on AI breakers, Quetzal's ability, or Always Be Running, might want to avoid fracters whenever possible, and use the cheaper breaker in the few times they need it. It's much the same logic of why someone would run ZU.13 Key Master over Gordian Blade in their decoder slot. But expect to see Paperclip around. It's going to be a force to be reckoned with. Another flavor/educational review, continuing from the previous MKUltra review. 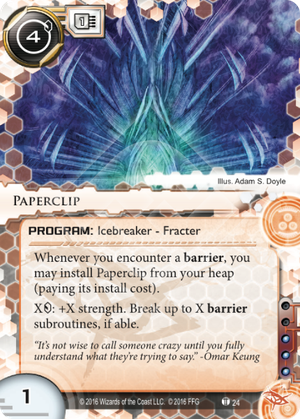 This card, in tandem with its two partners, is one of three conspiracy theories of history that appear in Netrunner as Omar's rig. Operation Paperclip was a United States OSS program, where over 1,500 German scientists, engineers, and other technical specialists were brought over from previously Nazi Germany, to be recruited into government positions. Many of these individuals were former leaders or prominent figures in the Nazi regime. The purpose for this project was for the U.S. to garner intelligence that would give them an edge in the developing Cold War and Space Race with the Soviet Union. This initiative was also carried out by the Soviet Union, though their methods were considerably more forceful (i.e. Forcing over 2,000 Germans, at gunpoint, to join them). The Germans to be recruited were based on a list of those with technical prowess (called the Osenberg List), compiled by the Germans while attempting to bolster their own technology to defend against the USSR, who had been thoroughly defeating them thus far. Eventually, pieces of this list were discovered by a Polish technician, and it eventually found its way to U.S. sources. The list was used to recruit and interrogate German technicians, scientists, and engineers. Those with worthwhile skills or knowledge were sent to detention and interrogation centers, sometimes for months. Much of those who eventually joined the U.S. and worked in vital technological positions were seen as "intellectual reparations" owed to the U.S. and U.K. It's believed that robbing Germany of some of its greatest minds severely hindered their technological recovery. This card was a huge design mistake. It has warped the meta so hard that barriers are all but non-existent. Why put a barrier in your deck when you can just play another etr code gate that is more taxing and probably has a facecheck punishment to boot? The fact that this card was still allowed to exist after MWL 2.1 shows that Boggs actually doesn’t know what he’s doing, and it scares me.